Wondering about things to do in the Bahamas in 2018, or which island to choose for your vacation? Here is our review of the most popular Bahamas vacation spots: New Providence Island and Nassau, Grand Bahama Island and Freeport, and Exumas. Nassau, the capital and the largest city of the Bahamas, located on the island of New Providence is full of culture and modern amenities. Once you land in Nassau and breath in the local euphoria, this ultimate spot will become your number one Bahamas vacation destination! 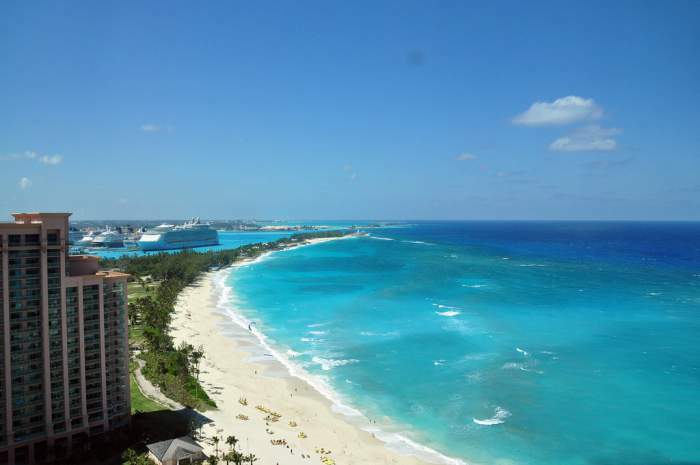 The Paradise Island, slightly north of Nassau, is connected to Nassau by a bridge through Nassau's main harbour, and is the most popular spot with plenty of things to do in the Bahamas - it boasts with life and entertainment. Paradise Island is packed with exclusive accommodations belonging to the famous Atlantis Resort, superb dining choices, a vast variety of shops, a vibrant and groovy nightlife, a casino, a golf course and even its own aquarium. This place has everything you need to have for one-of-a-kind, fun and chic vacation. Here on New Providence Island you will also find the best velvety-sand beaches with sparkling turquoise waters, that are a true traveller's dream to escape a cold weather or fully unwind and recharge from the everyday life. Nassau's crystal-clear sunny skies, flawless beaches and sparkling sea waters also make it the ideal place to shoot movie scenes such as 20,000 Leagues Under the Sea, Pirates of The Caribbean, modern family flicks and many others. An abundance of things to do in the Bahamas, attractions, tours and excursions will keep you busy during your stay on New Providence Island and are suitable for any tourist regardless of age. Choose between sightseeing and nature tours, segway, scooter, bike, and 4WD adventures, a ton of super fun and engaging water sports such as parasailing, paragliding, jet skies, kayaking, scuba diving, snorkeling, cruises, fishing tours, shore excursions, swimming with dolphins in the largest and most sophisticated marine habitat in the world, and for those that want a little bit of adrenaline can take a shark diving lesson. And that is not all, among all these great things to do in the Bahamas, there are plenty of attractions. Learn about the extensive history of Nassau and the New Providence Island by visiting places like Fort Fincastle, Arawak Cay area, the Government House, the Straw market, Nassau Cruise Port and, to keep your little ones busy, take the Pirates of Nassau tour, let your family go back in the days, when the pirates frequented the shores of the New Providence Island. Most international airlines have direct flights into the capital city of the Bahamas. Nassau's international airport, namely Lynden Pindling International Airport, welcomes aircrafts of all sizes coming directly from the United States, Canada and the UK. For those that would like to get a different type of travelling experience, the ferry express service is available to take its' passengers from Miami to Nassau. Inquire about their schedules and rates prior to your trip and be on your way to real paradise. Freeport, another popular Bahamas vacation destination will leave you speechless with its jaw-dropping beautiful beaches, elegant, sophisticated hotels and resorts and fabulous shopping choices. Freeport, the main city in the Grand Bahama Island is also surrounded by the majestic waters of the Atlantic ocean. Most of the tourist industry is situated in the center of the suburb of Lucaya, so be ready to experience the best things to do in the Bahamas, supreme attractions, the beautiful national parks and eye-catching gardens, when you visit this charming city of Freeport. Things to do in the Bahamas on Grand Bahama Island will include the perfect tropical cocktail of flawless beaches, heavenly Caribbean waters and recreational fun, that will give you that much needed adrenaline and excitement. 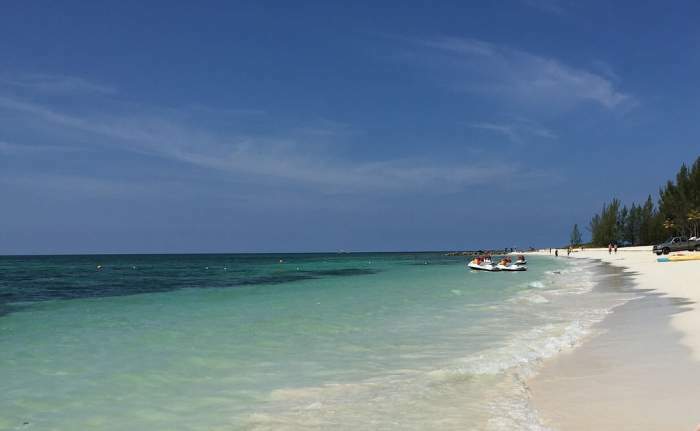 Freeport, a true Bahamian vacation destination offers its visitors a variety of activities to choose from such as cruises, sailing, scuba diving, snorkeling. To kick up a notch, take an airboat tour, which is one of the most popular attractions in the city. Nature enthusiasts will absolutely love the wildlife and sightseeing tours, as Freeport has some of the most indescribable scenery of national parks. Visit the Lucayan National Park and Peterson Cay National Park to admire the true beauty of the Bahamas. If you want more active things to do in the Bahamas, take one of the 4WD, ATV, biking, kayaking or canoeing trips, explore the island by sea or land, either way it will be the experience of a life time. Want to get closer to the smartest mammals on the planet? Swim with the dolphins, learn a few tricks on how to communicate with them and experience the true euphoria of interaction. Shark diving is also an option for a unique underwater adventure. To take your snorkeling to a different level, visit the popular Deadman's Reef, the most popular dive site in the Bahamas, and one of the most popular in the world. Extensive underwater caves and brilliantly colored coral reefs will amaze you, and the best part of it all is that snorkelers are able to access the dive sites right from the shore by swimming out to them, rather than using a boat. Some Canadian airlines fly directly to Freeport, and most of American airline companies offer direct flights to the Grand Bahama Island as well. Those coming from Europe, will need to catch a connecting flight either from Toronto, Canada or in one of the major US cities such as Atlanta, New York, as well as Miami, and Fort Lauderdale. Grand Bahama International Airport welcomes both domestic and international aircrafts of all sizes. Feeling like travelling by sea? Bahamas Express offers an enjoyable experience travelling to Freeport by a ferry. The ferry terminal is situated in Fort Lauderdale, that connects with Grand Bahamas Island and takes its' passengers to Freeport 7 times per week. What more can you ask of a perfect Bahamas vacation destination when you visit the beautiful Exumas? This is the more secluded spot that offers pristine beaches, clearest, most stunning blue waters on Earth and the one attraction the whole world is talking about-swimming pigs. Exumas is a district in the Bahamas consisting of about 365 islands, that are also called cays, this is where this magnificent region got its name from. Most of these islands are uninhabited, and those that are, have the most to explore! The Exumas, that are divided into 3 magnificent parts, Great Exuma, Little Exuma and the Exuma Cays are located 56 km (35 miles) southeast of Nassau with Georgetown being the capital city of this gorgeous Bahamian paradise. If you would like to vacation in a more tucked-away place with more of laid-back and peaceful things to do in the Bahamas, then Great Exuma and Little Exuma are just for you. The Exuma Cays on the other hand, are known for their exclusive resorts, luxury condos and beachside villas for rent, and the homes of some of the world-famous celebrities. Although the Exumas are more of a relaxing Bahamas vacation destination it still offers its' visitors some of the most unique attractions and things to do in the Bahamas. Aside from fun activities such as scuba diving, snorkeling, jetskiing, fishing and boat tours, and a variety of sightseeing adventures, there are also a number of extraordinary places to discover. Moria Harbour Cay National Park is home to some of the remarkable footprint-free beaches, sea grass beds, sand dunes, nesting seabirds and marine life. This is definitely a perfect escape to be close to the nature. Visit the Stocking Island to learn about stromatolites, the earth's oldest macro-fossils, or Allan's Cay, that is located at the top of the Exumas chain, where with just a grape popped on to a stick you may feed the wild iguanas. Have you seen hundreds of starfish scattered on the bottom of sapphire-blue waters? The Starfish Reserve will not only show you the true beauty of these underwater creatures but you may also hold and admire them. A Drug Plane, that crashed off Norman's Cay back in the 80s offers marvellous things to do in the Bahamas for those that love snorkeling, the waters here are crystal-clear and the visibility is perfect. Swimming with the pigs is one of the most popular yet quite distinctive attractions in Major Spot Cay, where approximately 20 pigs and piglets are always excited to see their visitors. Feed them, swim with them and have a blast, after all it's one of the most famous things to do in the Bahamas . Exuma International Airport is located on Great Exuma approximately 15 km (9 miles) away from this island's capital city George town. This airport services both domestic and international aircrafts so getting to the Exumas is simple. Direct flights to the Exumas are available from Toronto, Canada, Atlanta, USA, Miami or Fort Launderdale. Ferry service is also at your service from Nassau, New Providence Island, but keep in mind to check their schedules before your departure.